Originally, I was told the restaurant would close July 7th and would reopen in "about five months." New information I received earlier this week indicates the project's timetable has been slightly delayed. The closing date is not confirmed and is now projected for "early August." "Chick-fil-A at North Druid Hills is projected to close later this summer. It will be torn down and replaced with a new Chick-fil-A restaurant that features the chain’s newest interior design, increases capacity and will create an even more remarkable experience for our guests. 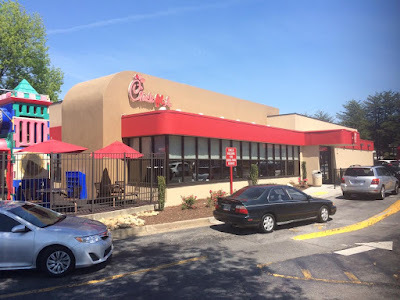 The restaurant was the first stand-alone Chick-fil-A restaurant for the chain when it opened in 1986 and has been operated by Franchise Owner Greg Mapoles since 1989. When it re-opens approximately five months after closing, the new restaurant will feature a kitchen, dining room and drive-thru service updated to not only handle current capacities but for future growth. The restaurant will continue to be open 6 a.m. - 10 p.m. upon reopening." Given the delay, Chick-fil-A North Druid Hills will now be open for Cow Appreciation Day, scheduled for Tuesday, July 11th. Anyone wearing anything "cow-like" will receive one complimentary entree. “We are so thankful for the millions of guests we have served over the last 30-plus years here at North Druid Hills,” said Greg Mapoles, franchise owner. “Their loyalty has created the opportunity to rebuild an even better restaurant to serve them. We encourage them to visit other Atlanta-area Chick-fil-A locations while we rebuild, and look forward to welcoming them back to our brand new restaurant later this year." When Chick-fil-A does reopen, it will be without its chicken salad sandwich which the company announced earlier this week would be eliminated from the menu as of September 30th. The next closest Chick-fil-A to the North Druid Hills restaurant is about three miles away near the Lindbergh MARTA station at Piedmont Road and Sidney Marcus Boulevard. A second drive-thru only Chick-fil-A restaurant is located about four miles way on North Druid Hills Road near North DeKalb Mall. If you work nearby and find a few miles too far to drive for lunch, Zoës Kitchen and Grub Burger Bar in Brighten Park and Willy's Mexicana Grill in Villages at Druid Hills are some of my favorite lunch options in the area. Are you excited for the new Chick-fil-A? If you work nearby, and are a frequent Chick-fil-A customer, where will you eat while the Chick-fil-A is rebuilt? What is your favorite Chick-fil-A menu item? Cathy allowed to sell the Chick-fil-A sandwich. I lived on those for lunch in the late 1960's during summer vacations when my Dad would bring them home for me. Not happy about the chicken salad sandwich. Not happy AT ALL. Is there a petition to get this reinstated? Wow - never knew that about Evans Fine Foods. My favorite is probably the original CFA sandwich too. But the spicy chicken sandwich is really good too, as is the new smokehouse BBQ chicken (although I heard that one causes operations issues so not sure how long it will last). Also, if you've never tried the chicken egg and cheese bagel for breakfast, it is really good. Theat property needs to be re-worked. I'm sure it will be more efficient after the re-build. However, first the cole slaw, now the chicken salad sandwich. I am very disappointed. Oh, and my regards to Ginna. Her family's restaurant was a wonderful place and I miss it still. Seems as if they are getting rid of the labor intensive foods. My guess is the lemonade will be taken out or replaced with a syrup based version soon. They absolutely would not get rid of the lemonade. Do you know how much they make with that? You wanna start a revolt, say you're getting rid of the lemonade and see what happens. LOL @ Collio's comment. But he is absolutely right. I spent many hours in the basement of this location squeezing boxes and boxes of lemons for the lemonade. It is legit. 3. Cole slaw. Awesome. Gone. 4. Chicken salad sandwich. Awesome. Gone. 5. North Druid hills Chickfila. Awesome. Going...going...Gone. for the sake of useless trivia, I know that Waffle House was one of the earlier places you could get a CFA sandwich. There's a picture on Atlanta Time Machine of the original WH (in Avondale Estates) around 1965, and its sign advertises having CFA. Congrats Greg!!! You have worked hard over the years in its sure paying off.